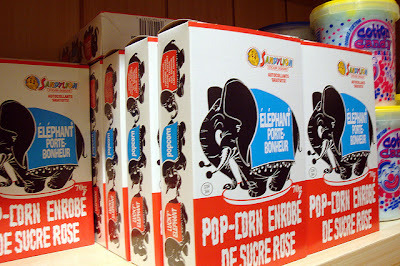 Do you remember pink popcorn? If you don’t you must have grown up in a cave. It’s still available worldwide, wherever there’s a sweet tooth one would assume. It was one of the treats we always loved as children. Not to date myself, but I think I remember paying 5¢ (or maybe 10¢) per little cardboard box when I was quite young. Why more folks don’t make fresh is beyond me. It takes all of about 10 minutes to do and is so superior to microwave popcorn. Have you ever read the package to see what’s in it? Perhaps you should… Palm and coconut oils are two of the vegetable oil that have saturated and trans fats. Popcorn is so easy to make and is great to do for movie nights with the kids (of any age). Just think of bringing a bowl of candy coated goodness to the den as you settle in for a fun movie. 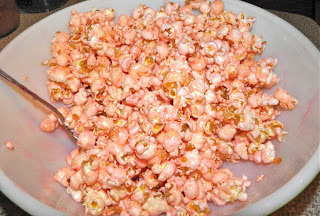 This is a jazzed up version of pink popcorn. There’s sort of a fad now for “sweet & salty,” so that is what I’ve done in the recipe. If you wish, reduce the salt for a slightly closer version to traditional packaged pink popcorn. Boil the sugar, water and butter together for 5 minutes. Make syrup first. 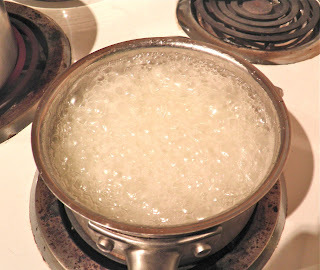 Bring the sugar, butter and water to a boil in a small saucepan. Reduce heat to medium and let cook for 5 minutes undisturbed. 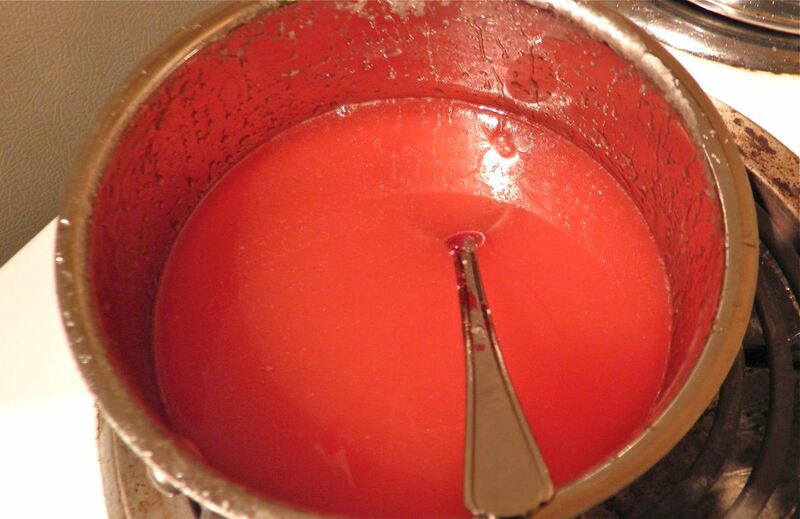 Remove from the heat, add salt and food colouring to the syrup and mix well. Return to the stove on low heat and keep warm while you pop the corn. Place the vegetable oil in a large pot on the stove and turn the heat on high. Once the oil is hot—it will “shimmer” and ripple in the bottom of the pot—add the popcorn kernels and cover with the lid. Add the food colouring and salt to the sauce before tossing. Watch for kernels to pop, once they start popping, turn the heat down to medium. Shake the pot on top of the burner to ensure all the kernels come in contact with the hot oil. This also helps prevent the popcorn from scorching. When the popping reduces to only a few pops every second or so, remove the popcorn from heat. My popcorn took less than 1 minute to pop.Carefully remove the lid so you don’t get hit with any last kernels of popping popcorn. Pour sauce over popcorn and mix well. Let cool and serve. Because of the sugar syrup it's at its best within a few hours of making. If you like this post retweet it using the link at top right or any of the links below.